Forget the Big Mac and check out this SUPER sized Tomato Stack!! Not only is it outrageously DELICIOUS, it's incredibly SIMPLE, EXTREMELY healthy, and ABSOLUTELY beautiful! Tell me you wouldn't want to DEVOUR this tasty treat that looks like it was prepared by a 5 star Chef! 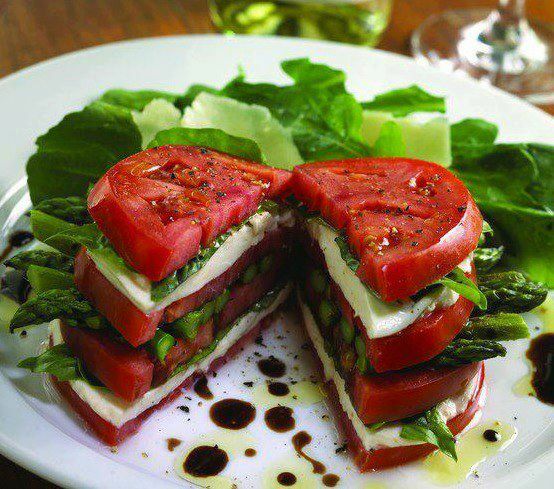 Just stack tomatoes, some mozzarella cheese and asparagus and a splash of balsamic vinaigrette. I would love make this tomato dish but can't find the recipe. Can you provide it for me?